This time of year, it's seems that we're all making resolutions. Working out more or eating better seem to be popular ones. As we think of our goals for the New Year, it's a common practice to look back on the year past and consider what we would have done better or would have changed. As I take my own mental review, one blaring memory came to mind. As a Family Life Educator, I teach many programs each year on brain health – so many so that I could probably give our brain health program in my sleep. Even so, one program a few months back stands out to me. During the question and answer time, one gentleman politely raised his hand and kindly asked me, "What do you do to take care of your brain?" Now, you would think as someone who regularly teaches about brain health that I would have my list ready as to all the ways I take care of my brain. Wrong. As I struggled to recall the brain health contributors I had just taught in class and mentally match them to my daily activities, I quickly relayed that taking my dogs on a daily walk is one way that I take care of my brain. While his question rattled me on the spot, it did lead me to ask myself, "really, what do I do to take care of my brain?" Right then and there, I resolved that I would identify the ways I practice brain health in my daily life and, if needed, look for practical ways to incorporate more brain health contributors. Improving your sleep. Sleep affects both our mental and our physical health and it helps us think better, focus better, and solidify memories. Aim to get quality sleep by implementing a sleep schedule (going to bed/waking up the same time daily), relaxing before bedtime, and even limiting your use of electronics before bed. Eating a heart healthy diet. Your brain needs lots of fuel and what you put in your body can have an impact on brain functions like concentration, focus, and even how your brain grows. Consider adopting a heart healthy diet full of lean meat, whole grains, fruits, and vegetables. Increasing your physical activity. Exercise improves brain function by protecting against nerve cell death, promoting new neurons in the area of the brain where memories are formed, and helping with better concentration and reaction time. Strive to engage in 30 minutes of physical activity at least 3 times a week and be sure to engage in activities that are of interest to you. Also, consider physical activities that engage both the brain and the body – like dancing – for maximum brain health impact. Managing your stress. Research has demonstrated that exposure to chronic stress creates long-term changes in the structure and function of the brain. While we cannot eliminate stress from our lives, resolve to manage your stress to reduce the harmful effects that stress has on the brain. Create a stress action plan – a list of your "go-to" activities that help you combat stress and, when you're feeling stressed, take action! Expanding your social/emotional network or support. Having social and emotional support contributes to brain health. Several recent studies have shown that individuals with higher levels of social activity have less cognitive decline than those who are not as socially engaged. Joining a social group or a club, starting a weekly lunch date with friends, or takin an Extension class are all good ways to increase your social involvement. Social and emotional engagement with others can contribute to the brain's vitality. Completing a daily brain challenge. By participating in intellectually challenging activities, you can contribute to your own brain health. It is important to choose an activity that is of interest to you so that you will stick with it. Choosing a novel or new activity to you challenges your brain and helps you break a mental sweat. While traditional brain puzzles like word games and crossword puzzles are good choices, also be sure to consider non-traditional brain challenges like learning a new language, taking piano lessons, journaling, or even traveling. Whatever activity you choose, make sure that it challenges you so you get the most benefit. One way I resolve to be good to by brain every day is to challenge my brain to complete a daily brain game. While shopping this past holiday season, I found a brain games daily calendar in a store that features a different fun and challenging word, number, or conceptual puzzle every single day. When I looked at what I am currently doing for my own brain health, I realized that I am not currently completing a daily brain challenge. It seems like a good idea to step out of my comfort zone and I am really looking forward to completing a different puzzle every day. 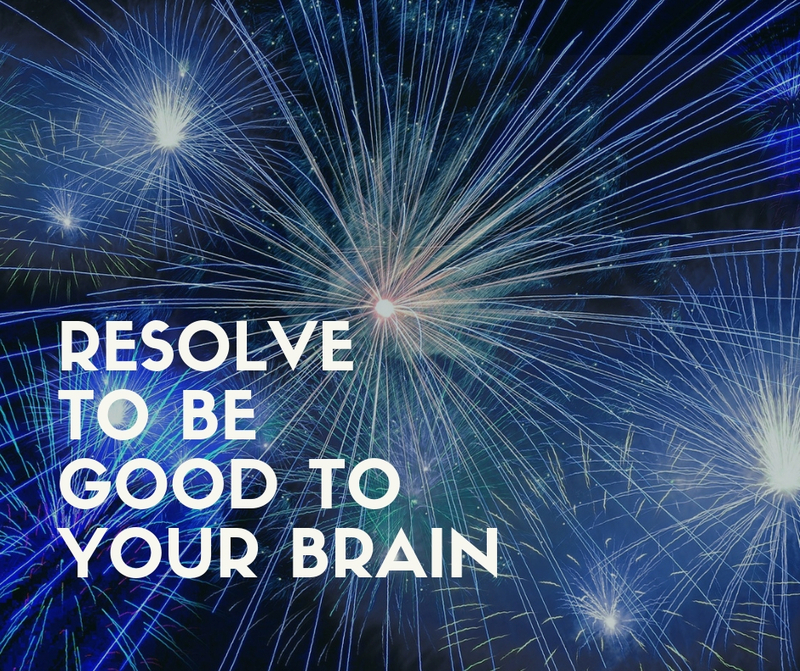 Whatever resolution goal you choose this New Year, resolving to be good to your brain by adopting one of the brain health contributors is an excellent choice. Your brain will thank you!